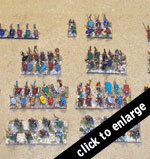 This is how I deploy my figures as a Roman Republican legion circa 140 B.C. Here is a view of what a Roman legion would look like when deployed. I like to have some of the maniples in loose order (3 F.P.S.) and others in close order (4 F.P.S.) Above is a single legion. At this time a legion a legion had two parts. One part was of Roman citizens and the other of Roman Allies. The each part was divided into maniples (handfuls) of 60 to 120 soldiers each. There are 10 maniples arrayed in three lines which included line one line (10 maniples) of hastati. The second line were identical to the first but were called princeps. The third line were arrayed 300 to 1200 triarii. The maniples of the triarii were half maniples. 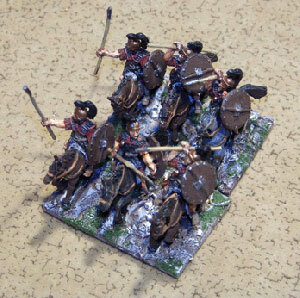 Preceding the three lines of what we would call line infantry were 600 to 1200 skirmishers called velites. On one of the wings would be posted an ala or wing of cavalry. Each line represents 1200 men for the hastati and princeps. The triarii are about 600 men. A single legion had two parts whci at this period time was considered one whole legion. For larger battle you do not need to get more figures. Below I have taken the same number of figures as used in my first photo and just rearranged them. In this case I have gone from the typical manipular deployment and have elected to go with a larger figure representation of 1 figure representing 100 real men (1:100). In this instance I have arrayed the legion in lines rather than maniples. This takes up a notch from true tactical level to a larger tactical level. Here each line is represented as ten maniples grouped together as three independent lines. As we use exchanging of lines in the rules the effect is the same giving the Romans the ability to retire back behind the supporting line. If you wish to deploy larger forces such as a full consular army which has 4 legions-2 of Romans and 2 of Allies also with a scale of 1:100 it may require a large number of figures but not as large as using the first manipular system; we just increase the figure representation. Such an army is shown below. A Consular Army is What? 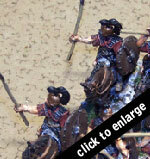 In the photo above you are seeing at the bottom of the image a line of velites. Behind them are the hastati followed up by the princeps who are in turn supported by the triarii. 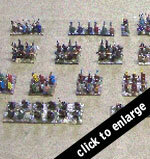 On each flank is an ala (wing of cavalry (about 300 for each section of a single legion). At the very top of the photo directly behind each half of the army are the legionary commanders each having a specialized foot unit called the swift. 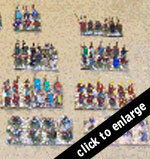 Players can add individual mounted figures to represent the tribunes. A consular army is actually 4 legions by our understanding. The army had two sections of two legions each. The center legions were all the Romans and on each side (flank) of these were the Allied legions.